Most beginners have trouble knowing when the game is over. The game is said to be over "when neither player can make further profitable moves." But it is often hard to see when that time comes. Here is another look at the sample 9x9 game we saw before. Black can pass and that would be the usual outcome. Black can resign. After all, the score is black 14 to white 17 (see my page on resignation ] but that would be unusual. Black can play inside Black territory, but that would occupy a Black point and reduce the Black score by one. Sometimes you have to do this to protect against weaknesses, but not in this game. Black can play inside White territory. Let's look at that last choice in more detail. First ask what is Black's object in continuing to play? If it is possible for Black to build a living group inside the White territory, then obviously that would be a good idea. In this game, there is no hope of building a group with two eyes inside either of White's areas. If you can prevent the opponent from making two eyes you will kill the whole group. You can't ask for a better outcome than that. To cut and capture something. It's easy to check for this possibility, If there are no good cutting points, forget it. This is often possible with small groups, but a little too advanced for this discussion. To hope the opponent makes a mistake. This is often seen in games. Personally I believe that you should win games on your own and not by your opponent's mistakes, but I think that is a minority view. There is nothing wrong with this, and most patient players will be happy to show you what happens. But this will often lead to you losing points too. (see below.) Be aware that some people will get annoyed, however. There is nothing worse than dragging a game on for 20 or 30 moves after one player thinks it is over. How can you lose points by continuing to play? Suppose Black decides to attack the lower left white group - hoping to prevent White from making two eyes. What might be a good place to play? 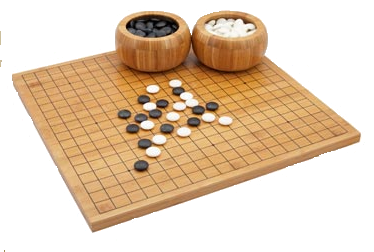 There is an old Go proverb that says "my opponent's best move is my best move." You can probably see that if White had a stone at a as in this diagram, it would be easy to make two eyes. So that makes it a good point for Black to evaluate. Let's assume that Black plays there and then look at White's response. White's problem is to ensure that there are two eyes. There is quite a bit of empty space so this should not be difficult. Dividing the interior of the group in two by building a little two-stone wall in the center seems to be an easy way. The wall could be on the second line or the third line. I will illustrate the third line choice. (There are certainly other possibilties too.) Certainly if White played there, the white group would have two eyes. But supposing White decides not to play...? Does this mean the exercise is over for Black? Maybe not. The interior White wall is not yet built. Perhaps Black can block it, by playing the same place. If White ignores this last move, is it possible that Black may be able to deprive White of two eyes? White can certainly reply to Black's move and stay out of trouble. Now White plays to resolve the situation, but let's look what happend to the score. Black gave up two stones,but White responded to one of those moves, and reduced the territory by one point. Thus Black lost two and White lost one. Every similar move within an opposing territory loses a point, unless the opponent responds to it.